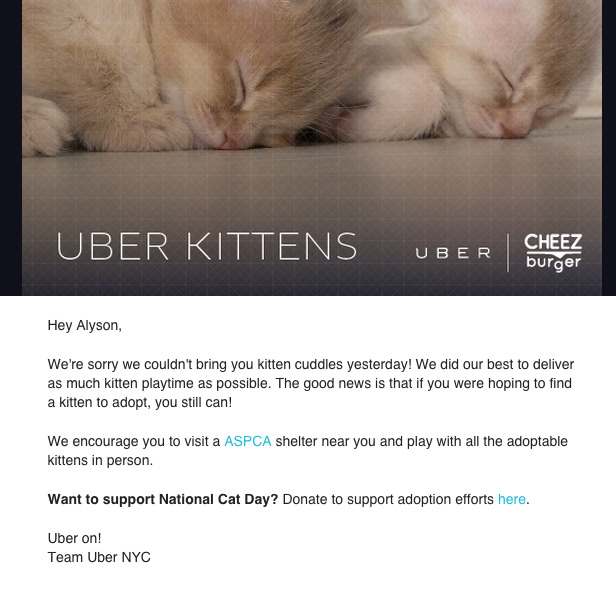 On Oct. 29, many New Yorkers and Washington D.C. residents were upset to learn that there was a kitten shortage on Uber. 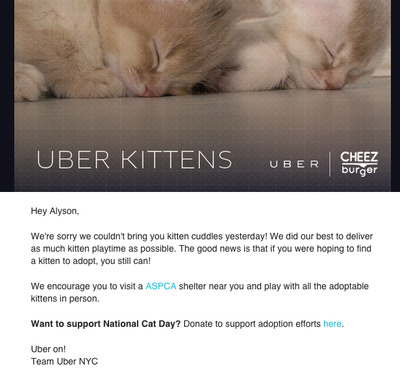 Uber and Cheezburger Network teamed up to promote National Cat Day. They pledged to bring on-demand kittens to your door along with Uber’s traditional ride-sharing service on the app. But from the moment the promotion launched at noon, kittens were hard to come by. Business Insider tried to hail one for three hours before we gave up. The only group on Twitter we saw get a kitten was a startup backed by Uber co-founder Garrett Camp. We ran into Ben Huh of Cheezburger Network at Web Summit in Dublin. He said Business Insider wasn’t alone. Huh says the teams crunched the numbers and learned that your chances of winning the lottery were actually better than getting an Uber Kitten delivered that day. And Uber kitten had no surge pricing, so there was no way to tip the kitten lottery in your favour.